Hearts were heavier this year for the Tour De Turquoise, an annual cycling event that has raised over $100K for the island and celebrates the community’s youth. 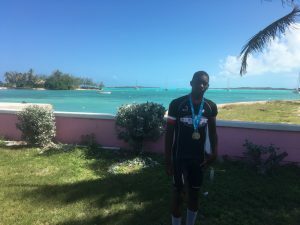 As philanthropists rode side by side with students from the local high school in Exuma, all 70km on a sun-kissed Saturday morning, there was one young man on their minds. Cameron Williams, 16, died last December in a tragic sailing accident, an incident that shocked and saddened this small, close knit community. On an island like Exuma, with a population of just 5,000, Cameron’s loss was a major blow, particularly for some of his closest friends. The emotion of the day was not lost on Howard Chang, the event’s founder. As Cameron came forward to receive his medal, Howard draped two around Keivardo’s neck – one of him, and one for his friend. “In addition to being a great sailor, Cameron also loved cycling,” Chang said. That was the final moment of Tour De Turquoise 2018, which this year raised nearly US$20,000 for the Exuma Foundation of Canada. The 4th annual ride, on February 10, was once again a resounding success for both the locals that have embraced cycling and the philanthropists that return year after year to give back. For several magical days, donors from both Canada and the United States took in Exuma’s famously blue waters, pristine beaches and unique character. Guests can explore the island’s many nooks and crannies, or hop on a boat and cruise up the Exuma Cays, seeing the giant iguanas, sandbars, celebrity islands and the world famous swimming pigs. But apart from the relaxation and cycling, what makes the event special is its genuine impact on the local community. Since its inception, funds from the Tour De Turquoise has generated well over US$100,000 for Exuma. These charitable dollars have gone towards many worthy initiatives, such as the purchase of a hospital bus, the construction of an upcoming children’s shelter and the creation of the first Exuma Cycling Club at L N Coakley High School. Last year, the Foundation invested in a “clubhouse” at L N Coakley to house an inventory of bikes for the students. The next step, according to Chang, is to invest in education and training so these young athletes can reach the next level. “These kids have a clear enthusiasm and thirst to learn,” he added. Sponsors of the ride included Dilly Crab Ranch, Grand Isle Resort, GIV Bahamas Inc. and the Bahamas Ministry of Tourism.